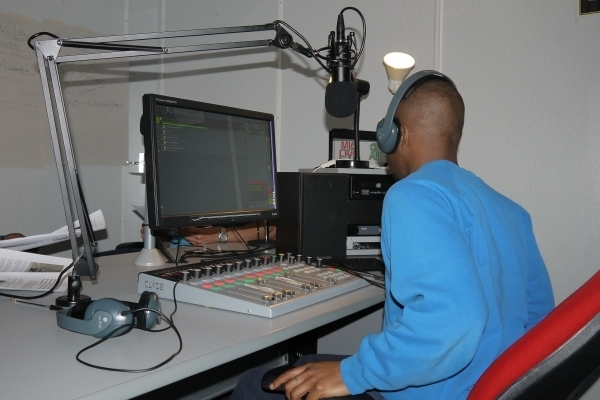 • Making a radio programme – where they will learn all about planning a show, using the studio and editing. • Presenting for Radio – this module gives the participants an insight into broadcasting law (the do’s and don’ts of radio), how to plan and script a show and all about presenting. • Radio Interviewing – this module will teach participants all about microphone techniques, interview prep and practise and how to carry out an interview. • Radio Journalism – where they will turn press releases into scripted news bulletins and record these for broadcast. Participants develop knowledge of how radio works and the responsibilities of those involved in the process. Over the course of the 12 weeks the participants will create at least 3 shows a week, which are added to the weekly schedule for the HMP Grampian based station Con-Air. These are played out to all the cells in the prison. Five participants have completed the qualification and will be receiving a SQA Level 5 qualification. One of the participants who completed the course said: "The radio course has developed my understanding of all the work , effort and in cases research that goes into making a radio show. It has helped me learn the value of scripting a show and the essential of advertising. The team from shmu have been very helpful and understanding in making allowances where needed. I look forward to any future work in radio and more so to future work with shmu. Thanks guys." A new Radio Broadcasting Group will begin in the next few weeks.